Compare to Bayer&reg; Aspirin active ingredient. Aspirin 325 mg Regular Strength Coated Tablets is a pain reliever/fever reducer for adults, and temporarily relieves headaches and everyday aches and pains. Aspirin 325 mg Regular Strength Coated Tablets delivers fast, safe pain relief plus lifesaving benefits. Aspirin is not appropriate for everyone, so be sure to talk to your doctor before you begin an aspirin regimen. This product is caffeine &amp; dye free, as well as gluten free. Compare to Bayer® Aspirin active ingredient. Aspirin 325 mg Regular Strength Coated Tablets is a pain reliever/fever reducer for adults, and temporarily relieves headaches and everyday aches and pains. Aspirin 325 mg Regular Strength Coated Tablets delivers fast, safe pain relief plus lifesaving benefits. Aspirin is not appropriate for everyone, so be sure to talk to your doctor before you begin an aspirin regimen. This product is caffeine & dye free, as well as gluten free. Ingredients: Active ingredient (in each tablet): Aspirin 325 mg (NSAID) nonsteroidal anti-inflammatory drug. Purposes: Pain reliever/fever reducer. Inactive ingredients: corn starch, dibasic calcium phosphate dihydrate, hypromellose, talc, triacetin. This aspirin tablet is as good as any available....and it costs LESS by a major number than any nationally recognized (Bayer) brand. If you value what your dollar can purchase then buy these when you need aspirin. 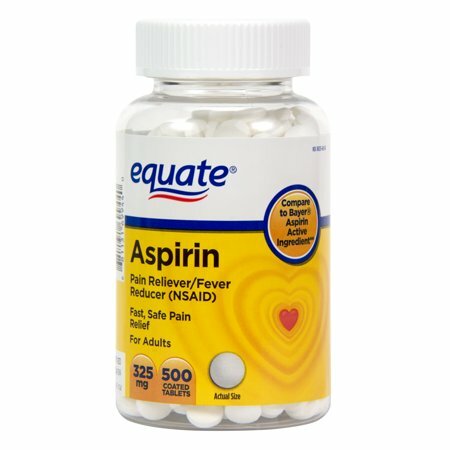 Brand-name aspirin is very expensive and contain the same ingredients as Equate. This is your best buy! Great price and works as well as name brands. It really relieves pain. I always buy Equate brand products and they are all great. I TAKE ONE EVERY SINGLE DAY TO KEEP MY HEART IN SHAPE. Equate brand Aspirin is as effective as any other brand; a great price, good product ,and quick shipping = a great transaction.